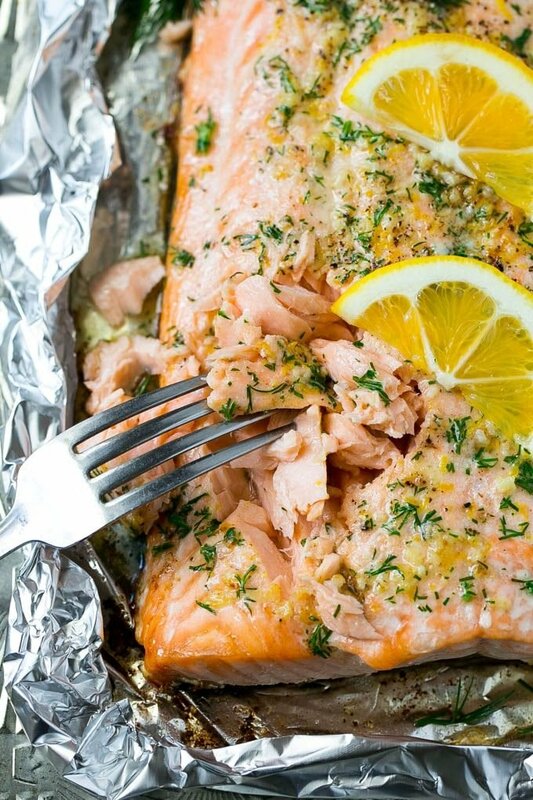 This recipe for salmon in foil is the easiest and most delicious way to eat fish! 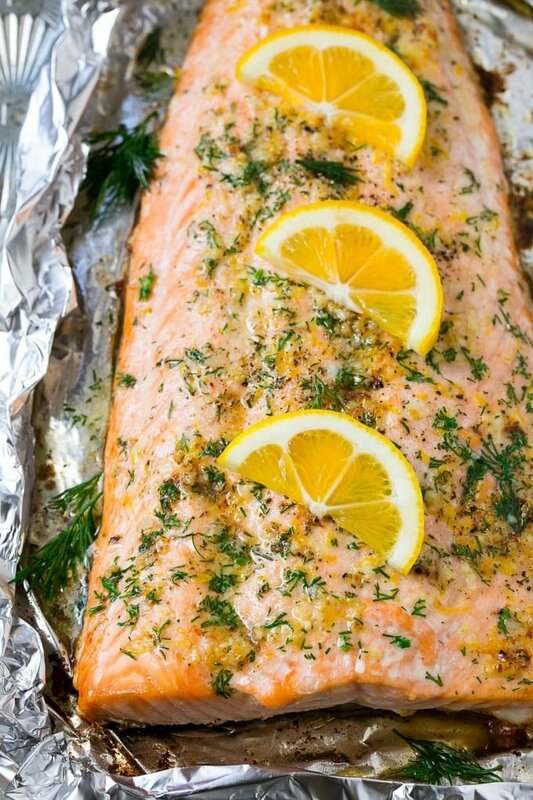 Salmon is flavored with lemon garlic butter, baked in foil, then topped with fresh dill. The perfect meal for any occasion! Salmon in foil is so simple to make, and it comes out tender and flavorful every time. Serve your salmon with mashed potatoes and grilled asparagus for a complete meal. I am not even exaggerating when I tell you this salmon in foil is some of the best salmon I’ve ever had. This recipe is most definitely going on our regular dinner rotation, and best of all, it couldn’t be any easier to make! How do you make salmon in foil? You’re going to want a large fillet of salmon for this recipe, anywhere between 1 1/2 to 2 pounds. I like to spring for wild-caught salmon for this recipe, only because it’s such a simple preparation and I feel like the wild caught salmon tastes better. But of course it’s also more expensive, so use what works for you (and your budget!). 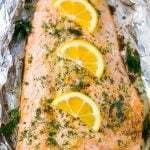 I cover the salmon in a garlic and lemon flavored butter, then wrap it in foil and bake! 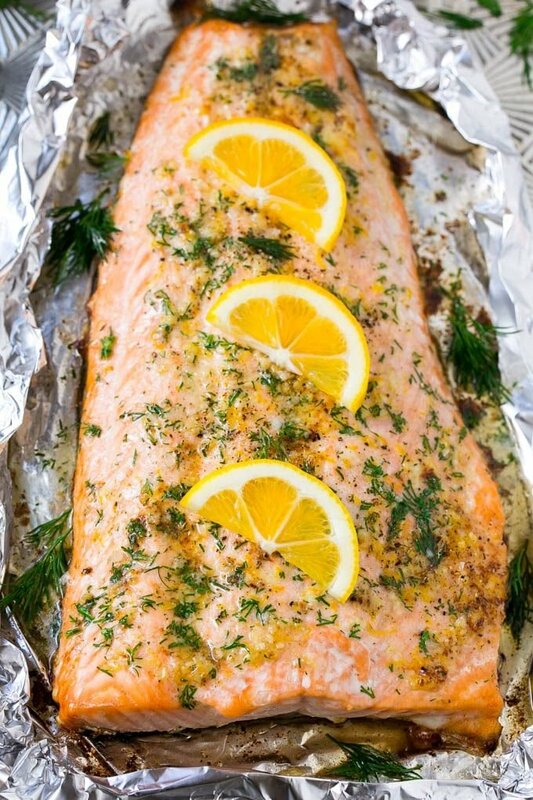 The bake time for this salmon in foil will depend on the size and thickness of your piece of fish. I’ve made this recipe multiple times, and my fish is typically done within 15-20 minutes. The foil keeps the fish from drying out and locks in all of that delicious butter so that it can fully permeate the salmon during the baking process. I like to uncover my salmon and broil it for a few more minutes to get some crispy edges. The final step in the process is to add a generous sprinkling of fresh dill and some lemon slices for garnish. I know most people don’t keep fresh dill in the fridge, but it is really SO good on this salmon! If you’re in a pinch you can substitute parsley or chives, but definitely try it with the dill at least once. This salmon in foil is perfect served with a side of rice and green veggies, or with a loaf of crusty bread to mop up all that extra butter sauce. This is definitely a recipe that will convert even the most staunch fish haters in your life! Preheat the oven to 375 degrees. Line a sheet pan with foil and coat the foil with cooking spray. In a small bowl mix together the butter, garlic, lemon zest and salt and pepper to taste. Place the salmon on the foil and pour the butter mixture over the top. Cover the salmon with foil and bake for 15-20 minutes, or until fish is just done. Turn oven to broil. Uncover the fish and place on top rack; broil for 5 minutes or until lightly browned. Remove from oven and sprinkle with dill. Add lemon slices for garnish and serve immediately. I made this recipe tonight and everyone agreed the texture and moisture of the fish was really good. As for the taste, it had mixed reviews. My husband and brother in law found it very plain (they are used to spicy food). I found it good. It suits the American/Western European palate. Due to the fat in the fish and the butter, it is quite filling. I got a 1.5 lb fish and 4 of us could not finish it. I served it with roasted potatoes cooked at the same temperature for 40 minutes (I added the salmon halfway through). I just realized there’s a little typo there. It should say “turn oven to broil” not “turn over to broil”!. Simply switch your oven to broil and open the foil, no turning required. Sorry about that! Can you wrap in parchment paper before the foil? Trying to cut down use of foil since there is a link to dementia. Just bought some wild salmon, so will try this recipe. Okay if I cut the recipe in half? Their are only the two of us, and I don’t want to waste any of this delicious salmon. Yes you can definitely cut the recipe in half, hope you enjoy! This salmon looks so good. I love making salmon at home for the family, but I’ve never used it with Dill. Thanks for sharing your recipe! Can’t wait to try it. It’s based on 6 servings! Salmon is a family favorite so I’m always looking for new ways to prepare it. I think my family would really enjoy this salmon version. Looks so good! We are trying to eat more fish and I’m a fan of easy meals with minimal clean up!